The term solid wood flooring simply refers to all wooden floor boards made from solid hardwood (typically Oak) or softwood. Planks of timber are sawn for a log, air seasoned for a period then kiln dried (ideally to a humidity of around 8-10% for domestic / commercial use in the UK and Western Europe). The kiln dried planks are then parallel rip sawn and machined to a T&G flooring section. T&G boards are often then end tenoned (particularly in the case of short boards) with a matching tongue and groove. Major defects can be cross cut out yielding a proportion of shorter higher grade boards which are laid as normal with the longer boards. 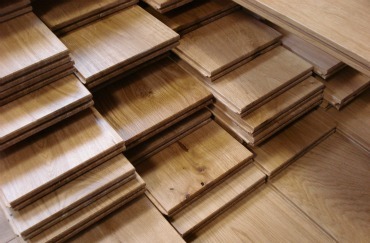 By far the most common species of solid wood flooring traded in the UK, Western Europe and North America is Oak. Oak flooring is also traded widely throughout the rest of the world, particularly in Russia and the Middle and Far East.